Has your child ever had to have an injection or a blood test? My daughter had to have a few local anaesthetic injections along with twelve stitches in her chin (skate-boarding accident). The whole experience was traumatic for her as well as for me – partly because I knew what was coming and partly because there was little I could do to help. Although the whole thing was over within an hour, I did think about the bravery of children who have to endure injections and other medical procedures over longer periods of time or regularly. An understanding of what’s happening can take a bit of the sting out of needles, which is what prompted designers Esther Wang, Annet Bruil and Tommy Lee to create Rabbit Ray. 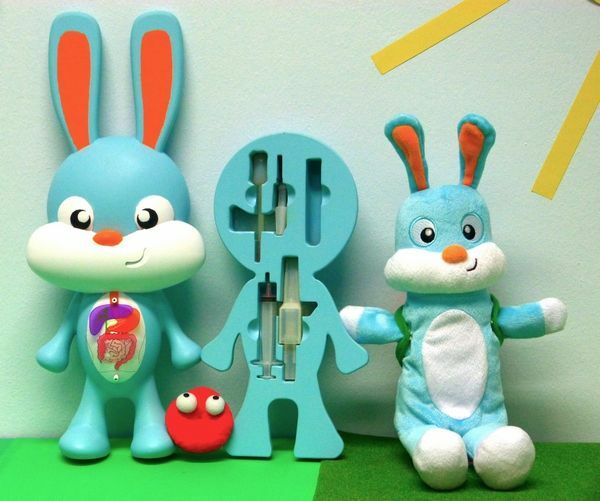 Rabbit Ray is an educational toy that allows children to become familiar with procedures associated with collecting blood and injections. Children can practice procedures on Rabbit Ray, ask questions and understand what happens when a blood sample is taken or an injection given. Rabbit Ray was created after consultation with health professionals and parents who deal regularly with children undergoing medical procedures. Those working in the field overwhelmingly reported that if you show children what to do and what to expect they are less frightened – after all, you can’t prepare for what you don’t know. The Rabbit Ray kits include child-friendly and realistic tools (that have been re-sized for little hands) that let children practice drawing ‘blood’ out of Rabbit Ray’s arm and ‘testing’ it in a test tube. There’s also an x-ray transparency showing major body organs which allows kids to perform an x-ray scan on Rabbit Ray’s tummy, and a ‘Red Blood Cell side-kick’ to help children understand blood cells. Rabbit Ray is crowd-funded project – help get him on the market by contributing through Indiegogo.